Expect to Pay: around £1 per cake, £1.10 and up for beigels and sandwiches. The antithesis of the recent rash of boutique patisseries (not that we have anything against those), Rinkoffs bakery quietly continues to do the same thing that it's been doing for the past 99 years: serving up traditional baked goods at reasonable prices. 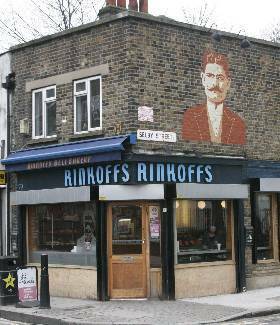 Although it was originally established as a retail business by the moustachioed chap whose picture is painted on the outside of the building, this cafe is now the last public outpost of a business (reportedly the East End’s last Jewish bakery) which is now more geared towards the wholesale market. The cafe itself is small and functional: the only seating arrangements are barstools around the window ledge which means that, whilst it’s cosy, you wouldn’t be inclined to spend hours in here. More importantly, however, is that as soon as you walk through the door you’re confronted with a huge range of traditional Jewish breads, cakes and pastries that recline seductively on the counter before you. They do a good range of bagels and sandwiches alongside their breads, but it’s the sweet stuff that really caught our attention. Their cheesecakes, fantastically fluffy confections whose creaminess is nicely offset by a slightly tangy aftertaste, are somewhat dangerously sold by the 100g - beware of ordering when you're hungry! Other notable treats are their Linzer biscuits, gooey chocolate brownies and a generous selection of pastries which includes their justifiably famous Danishes. Although it’s slightly off the beaten track, this bakery is definitely worth a visit if you’re in confectionery desert that is otherwise known as Whitechapel.